This map has a open sky mine where you can extract stone, limestone, soil, coal and mineral water. You use the stone crusher for the production of gravel, sand and tailings. You use a limestone crusher for the production of cement. Use tout-venant facilities for production of tout-venant and use asphalt facilities for the production of asphalt. With the soil you can extract gold at goldmaster, and when you extract gold your bank account rise. With the gravel, sand, cement, and tailings you can produce concrete at the concrete factory, and sell the concrete in the village construction area, also you can sell sand, gravel, and boardwoods. 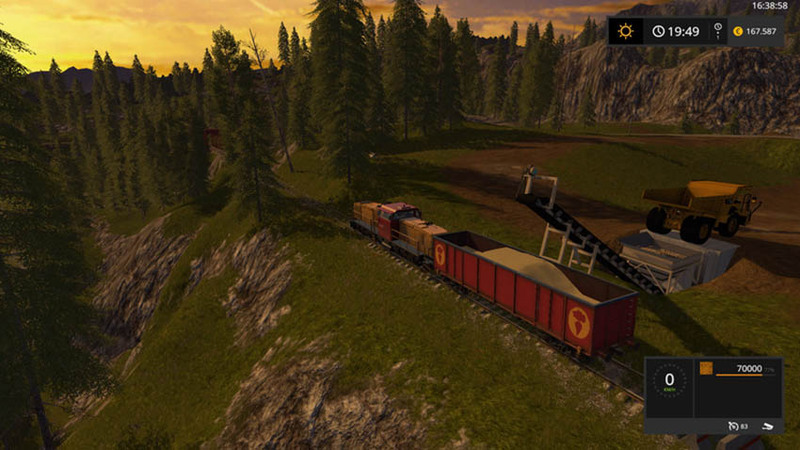 Exist a third train in the mine to load sand, gravel and tailings and sell in the end of the railroad. Be careful it’s a dead line. Please read this tutorial with calm and attention to avoid unnecessary questions. This map is easy to play if you understand how works all production facilities. You can therefore watch the videos tutorials. This time I don´t release a modpack for this version of the map like I do for fs15 version. Some modders don´t like other modders change their mods, so you have wait until the modders release mods for mining (excavators, dumpers, trucks etc). The vehicles in game are compatible with the map, you can play and use all features with the default vehicles. Fix coal and riversand extraction site. – change the 3ª railroad (now is more real, the climb to the mine is more soft). – Add a new Mine to extract Iron, and a new facility to produce Steel, and can sell the Steel at the harbor. – Compatible with mutiplayer and dediserver (the problem only the host see the displays is fixed, and the invited gamers can fillup the train. – The filltype heaps now is dynamics, more real. – New sawmill base on mCompanyscript. – From v0.5 don´t use anymore the UPK (universal process kit) for triggers. – Add light towers in the mine for work in the night. 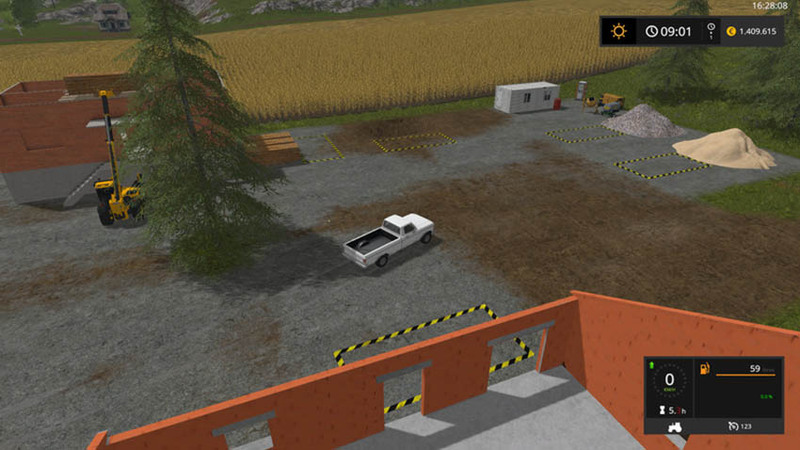 – Fix trigger to load cement on trailers (cement crusher). 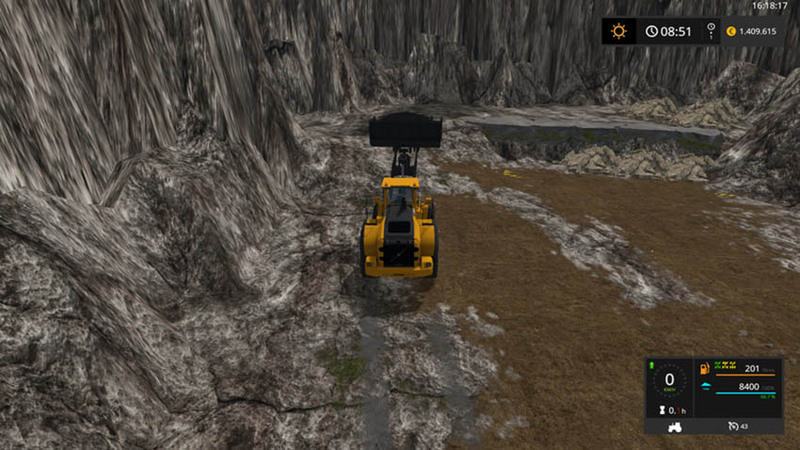 – Add washer spot in the mine to wash your mining machines. – New road to the harbor with new signs. – New PDA map with some local descryption. – Add animated horses on farm. This don´t have any function is only decorative (I like horses). New materials (riversand, riversand2, tires, rubber, stonepowder, gardenstones, grapes, redwine, portwine and grapejuice). Revised train system, now you can load: fuel, tar, cement, rubber, wood, woodchips, stonepowder, touvenant, riversand2 sand, and tailings. – Fix the triggers for toutvenant and asphalt (no more concrete). – water in the mine is no more mineral water (normal water). – the gold now is represented by a box and we pickup the box and sell the gold. – more signals with information what product need in the place or extract in the place. – add some animations (overloading pipe, water on goldmaster). – concrete factory, goldmaster, asphalt factory, toutvenant factory now use fabrickscript instead UPK. The problem in mutiplayer continue because the problem is on Universal process kit (UPK). I´m searching for a solution to create autofilltrigger. Like the idea but the map just wont load once you start a new game. bonjour comment fonctionne l’extraction des cailloux a la carrière ? I have the map and universal process kit but I can’t pickup soil etc… If someone had the same problem and solved it, I will appreciate to know the answer ! How do u download map for Xbox one? Vaak niet te diep willen graven met de shovel. Ik heb een mod laadbak van 11.500 en die doet het geweldig. Je dient een tankwagen te hebben die water kan vervoeren dan vervolgens er vlakbij rijden en opletten dat bovenin het linkerscherm de tekst veranderd. Hierna kan je de tankwagen vullen. This map does not work. The loader will not pick anything up. what to you collect tar from the refinery with ?? railway now loops round back to start point after going on other loop, magic wor selwyn !! what to use to get the tar from the refinery ? How do i load the gold? I cant sell my gold at the bank. Any ideas? any news on getting the autotrigger working on dedicated multiplayer so it picks up soil etc? works on singleplayer or hosted multiplayer(and only host can pick it up). Error: Running LUA method ‘loadSharedI3DFileFinished’. Love the map, The only problem I am having is that I can not plant trees. not sure if I am doing something wrong or not. is anyone having the same trouble? any help would be great. would love to see horses on this map. I have same problem. have you found an answer? Hello can someone help me please? Me and my friend tryed to run this map on multiplayer and I launched the server but he can not join. It says connection to the game was lost or something like that. The Map doesn’t work on a Dedi Server. From what i’ve read on other sites regarding this map. Its all to do with UPK. V0.5 will not load with latest Giants update!! Not showing any errors in the log and I only have the mining map in my mods folder. Any ideas what to do? How do I reinstall old version? how to start new game in the map? Same thing here. It worked great until the last Giants Update. No Mining Versions will load. If you have noticed none of the MODS run correctly with the new update 1.5.1 I tried running the game without any mods and it worked fine. I had to reload update 1.4.4 and all is well. Hope Giants will get it figured out. D:X fillpoint for Tar aint working I mean i have the kotte universal pack but i cant fill any of the kotte tankers with fricken Tar please give a tip on which item to use to fill tar up. Beste farmers, Als je uit de kotte universal pack de tanktrailer van 30.000 liter pakt dan dien de klep van de tank te openen,( is N op het toetsenbord is deze niet te zien tik dan op G en dan op N) vervolgens dan onder de vulstraal gaan staan en eventueel handmatig of automatisch vullen. Dit geldt voor de diesel en de teer. Zelf ben k nog aan het uitvissen welke fuels er nodig zijn bij de zaagmolen. Lots of good work but the cement loading is bugged emptied my mods folder and i still cannot load cement i also watched your demonstration video and used the belt to load still dint work . W hen you get a chance please check it out . Like what you did with the map .